Motifworks | What is artificial intelligence and what can it do for your business today? Home/Artificial Intelligence, Big Data, Blog, IoT (Internet of Things)/What is artificial intelligence and what can it do for your business today? Artificial intelligence (AI) is a term used to describe “smart” technologies that are aware of and can learn from their environments. This enables them to subsequently take autonomous action. Robotic process automation, machine learning, natural language processing, and neural networks all incorporate AI into their operations. What separates Artificial Intelligence from other software is that it enables machines to respond without intervention from the external world. AI enables a variety of other emerging technologies as well. 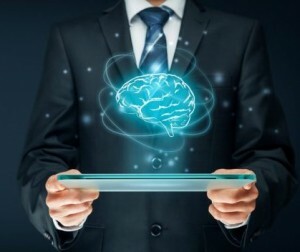 For example, it provides the “brain power” that allows robots to take on human-like characteristics, and it lends the analytical muscle that derives meaning from—and can act on—the flood of data generated by billions of interconnected devices in the IoT (Internet of Things). There’s a great deal of hype surrounding AI, but for business executives, it is primarily an enabler of enhanced innovation and increased productivity. That’s great, but what might that mean for you in your specific industry? Let’s take a look at some real-life use cases by industry. Conducting Legal Research – AI systems may be able to aid lawyers by performing legal research on relevant case law and applicable statutes in a faster and more thorough manner than what lawyers may be able to do on their own. Such AI systems may also be powerful enough to use data to predict the outcome of litigation and enable lawyers to provide more impactful advice to their clients in connection with dispute resolution issues. Legal Document Generation and Review – An AI system may serve as a virtual concierge for the intake of client information and the preparation of standard and routine legal documents and agreements for the benefit of your clients. Performing Due Diligence – Conducting a comprehensive due diligence review in connection with the huge amounts of data that are part of any merger, acquisition, or other sophisticated corporate transaction is absolutely necessary. An AI system may provide an opportunity to perform such due diligence in a faster, cheaper, and more thorough fashion instead of relying on a high-priced and bleary-eyed team of lawyers. Disease Identification/Diagnosis – As medical artificial intelligence systems have the ability to learn from past cases, they offer doctors access to the data concerning symptoms provided by patients, comparing them to other symptoms in the database, then considering the person’s history, and finally offers a treatment plan. Treatment Design – Artificial intelligence systems have been created to analyze data – notes and reports from a patient’s file, external research, and clinical expertise – to help select the correct, individually customized treatment path. Healthcare System Analysis – AI to sift through the data to highlight mistakes in treatments, workflow inefficiencies, and helps area healthcare systems avoid unnecessary patient hospitalizations. Projection of Market Demand – Artificial Intelligence algorithms can perceive patterns of demand for products across time, geographic markets, and socioeconomic segments while accounting for macroeconomic cycles, political developments, and even weather patterns. The output can be a projection of market demand. Predictive Maintenance – Using sensors tracking operating conditions and performance of factory tooling, AI learning allows prediction of breakdowns and malfunctions, and allows taking or recommending preemptive actions. Regulatory Compliance – The more efficient processing of information, for example in credit decisions, financial markets, insurance contracts and customer interactions, may contribute to a more efficient financial system. The applications of AI and machine learning by regulators and supervisors can help improve regulatory compliance and increase supervisory effectiveness. Customized Client Solutions – Artificial Intelligence helps companies analyze and understand how account holders spend, invest, and make financial decisions, so they can customize the advice they give their customers. Customer Retention/Acquisition – Financial services companies can use AI to detect brand sentiment from social media and text data, measure it, and transform it into actionable advice. Fraud Detection – Using Artificial Intelligence to spot unusual patterns and improve general regulatory compliance workflows helps financial organizations be more efficient and accurate in their processes. Reduce Shopping Cart Abandonment – By optimizing each user’s experience in their moment of need, AI is able to identify and address objections on the spot by analyzing every action a user takes: scroll speed, products and images viewed, mouse movements and hesitations, and more. Real-time Product Targeting – Predictive Analytics helps to show customers what they want to see. Using real-time product targeting takes the user’s intent and preferences and combines them with a brand’s product offerings to influence buyers at every engagement point. Predictive Merchandising – Using data-driven, cloud-based customer modeling suite helps merchandisers, retail planners, and inventory analysts better determine what to put where. By enabling retailers to understand how a specific customer shopping at a specific location chooses from an assortment of products, they can then predict what demand will be in different geographies. Whatever your industry, Motifworks is here to help you gain all of the benefits from using a purpose-built Artificial Intelligence solution. How might you use AI in your business? Let us know in the comments, or send us an email with your thoughts.